There are many aspects to this international crisis which originates in North Korea but extends into China, many of its bordering countries, and South Korea. 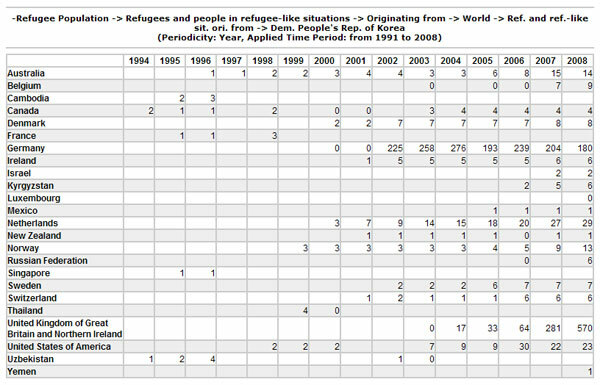 Indeed, as of 2008, North Korean refugees have officially settled in 23 countries (see chart from Radio Free Asia). We are an activism-oriented group, so rather than attempt to give a thorough run-down ourselves on the reason we exist, we provide an outline of the situation on the pages of this section and encourage you to read more at the provided links and resources. Before you jump in, one quick but important note: It is not the case that the outside world does not know enough about the problems in North Korea to take action. In an age of 20,000+ North Korean refugees having settled in South Korea (reached in late 2010), there is a wealth of information about the situation. What now remains is to muster the moral courage to fight and end the oppression and injustice.